In additi on to constantly improving the quality of products, services, Ba Ria – Vung Tau also focuses on environmental protection in order to lure more visitors and contribute to the sustainable development of local tourism. In recent years, tourists, especially the ones from developed countries, tend to travel to destinations with beautiful landscapes, clean environment, friendly people and interest in national culture conservation. Grasping this trend, Ba Ria – Vung Tau tourism sector strengthened public awareness-raising campaigns of environmental protection and closely supervised environmental quality in tourism businesses to raise the community’s awareness of responsible tourism. Positive results have been seen thanks to Ba Ria – Vung Tau tourism sector’s efforts, including environmental protection awareness of tourism businesses being raised, such concrete activities of many resorts and hotels for environmental protection as investment in wastewater treatment system that reaches the standard, waste classification, regularly cleaning beaches, planting trees to create healthy environment for tourists. 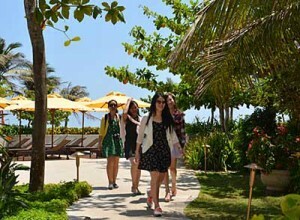 Specifically, in Vung Tau City, Grand – Palace Hotel is considered as leader in environmental protection. In addition to providing clean and beautiful green spaces, many years ago, the hotel implemented standard process in waste treatment, invested in wastewater treatment systems, solar power systems, solar water heaters, energy-saving lighting systems. These hotel’s activities fit trend of environmental-friendly tourists. Thus, Grand – Palace Hotel always welcomed a large number of international tourists (experts, traders) with long stay. Implementing environmental regulations, tourism businesses reaped the invaluable rewards. In early 2014, Grand – Palace Hotel, one of ten leading hotels in Viet Nam, received ASEAN Green Hotel Award in the 2014 – 2016 period. In 2013, An Hoa Residence (Long Dien District) was awarded a roll of honour recognizing the top 10 most impressive cultural tourism destinations in Viet Nam by Union of Viet Nam UNESCO Associations. An Hoa Residence is now striving for World Luxury Hotel Award organized by The World Luxury Hotel Award (UK) in June 2014. One of the criteria of this award is protection of sustainable resources and living environment.